Torchlight political processions do not have the most fortunate associations given the history of Europe in the 20th century, but just such an event was planned for November 3 by the joint ticket of ultra-nationalist and far-right parties in a campaign-closing event ahead of Bulgaria’s presidential elections. The event was scheduled for central Sofia at 5.30pm, about 15 minutes after sunset. Fortunately for those for whom torchlight processions do not have pleasant associations, light rain and a breeze were forecast. The parade was to be attended by representatives of the National Front for the Salvation of Bulgaria, Volen Siderov’s Ataka, VMRO and “supporting formations” such as the National Union, Zashtita (“Defence”), BG Patriot and suchlike. One may assume that black garb would be de rigeur. That joint ticket is headed by Patriotic Front co-leader and VMRO leader Krassimir Karakachanov, seen by most polls as running third in what continues to look to be a very tight race to be Bulgaria’s next President. 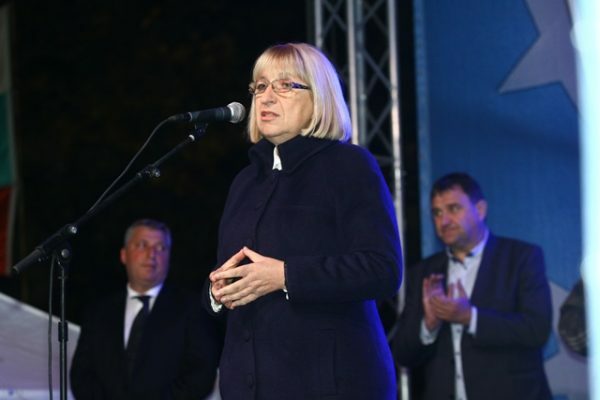 The leader in the race, though with victory anything but assured, GERB’s Tsetska Tsacheva, continued her message that Bulgaria has a “strong government” and, according to Tsacheva, even those who do not support GERB admit this. On the campaign trail on November 3, Tsacheva repeated her other by-now familiar talking points, that the President should work in the interests of all Bulgarian citizens, that it is essential for the country to continue on its Euro-Atlantic and European path. GERB presidential candidate Tsetska Tsacheva. 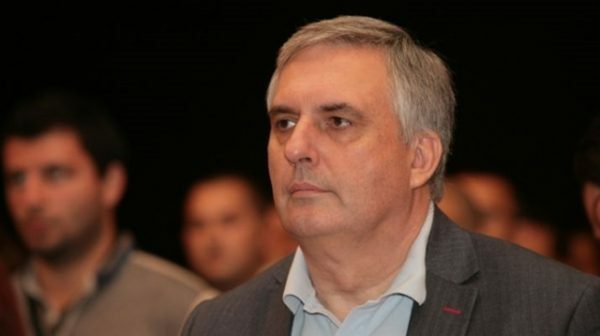 In an apparent reference to Prime Minister Boiko Borissov’s talk of resigning should she lose at the first round (though he has flip-flopped on that), Tsacheva said that GERB’s opponents were preparing to come to power “but they know they will lose”. “They have never won against GERB. We have 10 wins (a reference to various presidential, parliamentary and municipal elections) and are heading for 11,” Tsacheva said. The Bulgarian Socialist Party’s presidential candidate Roumen Radev – nominally the candidate of an initiative committee – described his “non-partisan” candidacy as having brought “a lot of turmoil”. His detractors, Radev told a crowd in Vratsa, had described him as “mauve red communist and an agent of Moscow, after that they said I am a covert Euro-Atlanticist and an agent of Washington”. Radev went on: “To help them, I will say I am an agent of the Bulgarian people and will be their agent when in power”. 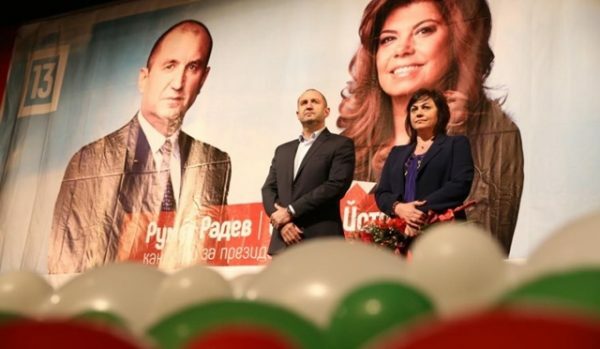 Bulgarian Socialist Party presidential candidate Roumen Radev in Vratsa, with BSP leader Kornelia Ninova. He said to achieve the necessary nationwide change, “we should not believe that the elections are pre-determined, nothing much is at stake and there’s no sense (in the elections) because everything is clear and let’s just appoint a president, so that one party has full control of the state and there will be stability”. “United, with joint efforts, we will win victory in the name of Bulgaria,” Radev said. 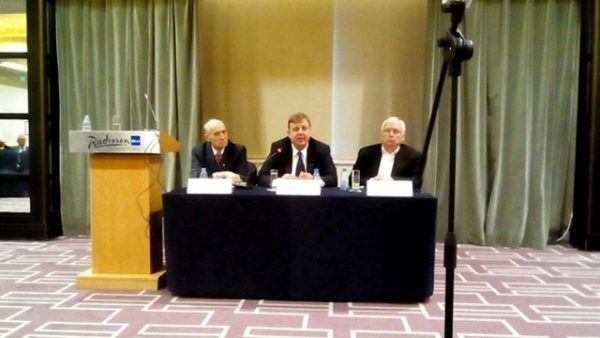 Karakachanov, meeting members of the National Association for International Relations and the Bulgarian Diplomatic Society, told them that Europe and the EU institutions were unable to conduct a real policy of integration towards migrants. Instead, he said, “Brussels bureaucrats” were imposing a new global ideology, a global society that weakened values such as religion, family and culture and gives way to radical Islam. He said that he stood for a Europe of De Gaulle, of homelands and sovereign democracies, not a Europe of neo-liberalism and globalisation. As President, he would initiate a referendum on CETA, but before that would want what he described as the “secret parameters” of this agreement declassified. Europe’s leaders were taking it on a dangerous road, Christianity had been traduced to third-rate status, multiculturalism and the integration of immigrants had failed, as the London 7/7 bombings had made clear, according to Karakachanov. He said that he “likes the EU” but said that Bulgaria’s interests must be protected and the state should require Europe to change its policy or adopt that of Visegrad Four, closing borders to illegal migration and revising the Dublin Agreement. Krassimir Karakachanov, centre, at a November 3 presidential campaign event. Karakachanov cited the “big gaffe” with Libya and what he called the Bokova-Georgieva case, a reference to the saga around Bulgaria’s successive candidacies for the UN chief post, “which could be defined as treason”. ABC presidential candidate Ivailo Kalfin, in an interview with daily Trud, asked whether Bulgaria should choose between partnership with the EU and Nato and maintaining balanced relations with Russia, said Bulgaria is a member of the EU and Nato and “when we joined the EU, good relations between Bulgaria and Russia were plus for our country, so it even helps us to be more effective and influential in the EU”. “Unfortunately, at times I feel that we continue to behave as a candidate country for the EU and Nato, which listens to decisions and implements them, rather than participate in discussing them. “Bulgaria has all the levers to change that. In the EU, for example, to reach a solution, it passes through different stages and each country can join in the discussions and defend its national policy. But if we do not know what our position is and do not join the discussions, then it remains only to comply with decisions already taken,” Kalfin said. ABC presidential candidate Ivailo Kalfin. He said that recently a drastic change of positions had been seen, in what he described as hypocritical behaviour, designed for domestic consumption instead of there being a purposeful policy. “Mrs. Tsetska Tsacheva called for removal of sanctions (against Russia), and the next day, Prime Minister Boiko Borissov called in Brussels to increase them. Eventually they stayed the same”. Kalfin said that he saw his chances of reaching a second-round vote in the presidential elections as “high” while criticising the changing of election rules during the presidential campaign: “That’s why Parliament’s approval rating is so low”. He said that there was “collusion” between the big parties, GERB and BSP, who were concealing their candidates “hiding them from debates because they are weak”. “They do everything possible to convince people that it is almost a foregone choice and that they will reach the runoff. 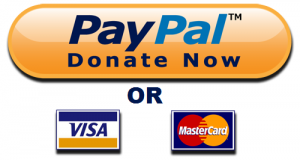 It is probably already decided which of them will be the winner,” Kalfin said. “So I urge people to vote and elect a president, not to vote for a person who hides from debates and is arrogant. Both Tsetska Tsacheva and General Roumen Radev cannot formulate a meaningful vision for the work of the presidential institution. The Reformist Bloc’s Traicho Traikov, speaking to Bulgarian National Television, dwelt on the need for radical judicial reform in Bulgaria. A prime priority was the prosecution, which he described as “working on the Soviet model, very old and inefficient, where the Prosecutor-General is not accountable to anyone, at the expense of total control of the work, careers and fates of every prosecutor in the system”. Reformist Bloc presidential candidate Traicho Traikov. Commenting on the field of candidates – for this first round of the election, on November 6, there are 21 in all – Traikov said that all candidates were opponents, but the danger that Bulgaria faced was that a leftist president would be elected, a “pro-East” (an apparent reference to Russia) president, not pro-Western and pro-democracy. “And regrettably we do not see in the main political party and their candidate (Tsacheva) enough capacity to stop that. The biggest chance is in a Traikov-Radev runoff,” Traikov said. Meanwhile, Mensa announced that out of Bulgaria’s 21 presidential candidates that it had invited to take an IQ test, only four showed up. They were Roumen Gulubinov, Dimitar Ivanov, Diana Dimitrova and Plamen Paskov. Their average result was 95, which Mensa described as “below average for society”. None of these four is seen by any poll as having the slightest chance of victory or even making it to a second-round vote.